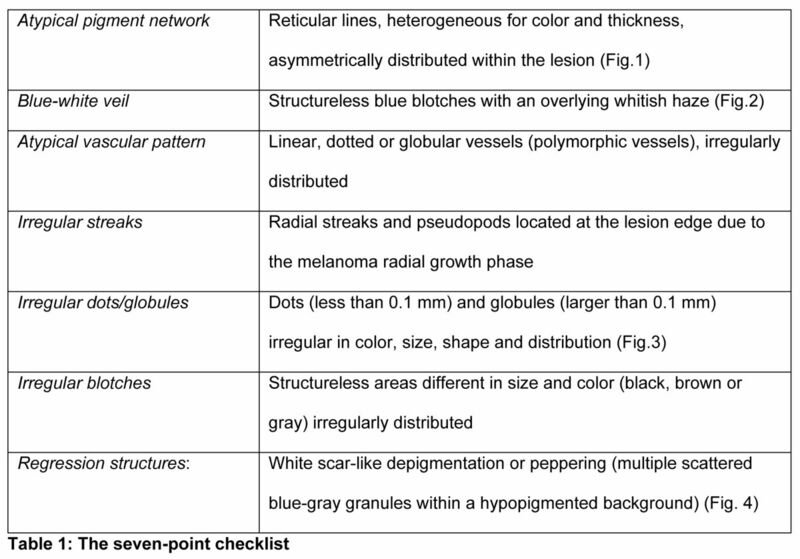 Seven, Point, Checklist, Melanoma, Incognito, Algorithm, Difficult Seven Point Checklist – cite! Seven Point Checklist (message) Seven Point Checklist – participate! In the latter years, a lot of analytical methods based on scored algorithms have been introduced both to simplify the dermoscopic learning and to improve the early melanomaThis glossary term has not yet been described. detection. The sevenThis glossary term has not yet been described.-pointThis glossary term has not yet been described. checklist, published in 1998, represents one of the most and latest validated dermoscopic algorithms due to its high sensitivityThis glossary term has not yet been described. and specificityThis glossary term has not yet been described., also when used by non-experts. The seven criteriameasure of how well one variable or set of variables predicts an outcome were originally tested on 342 melanocyticThis glossary term has not yet been described. 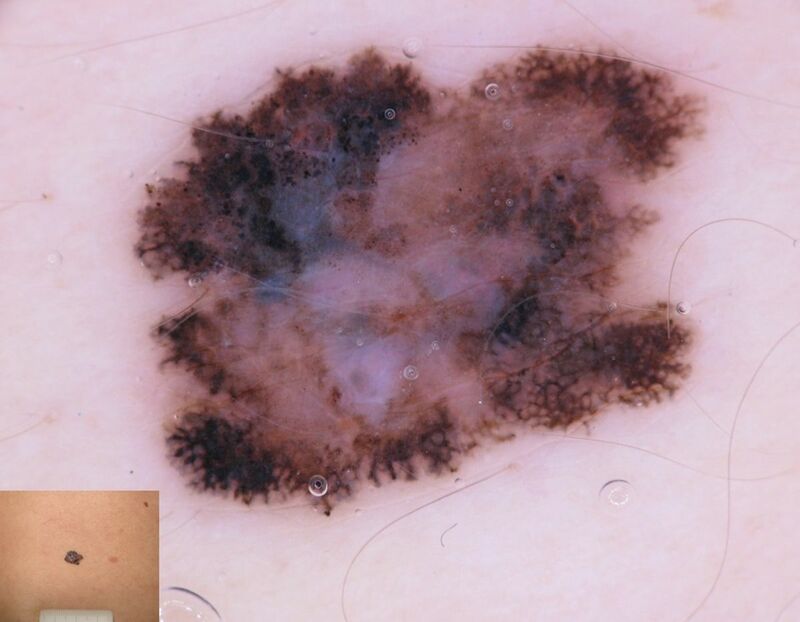 lesions (117 melanomas and 225 atypical neviNevi that clinically look like melanoma but that histopathologically are not melanomas) and were chosen for their frequent association with melanoma. Three of them were defined as major criteria (atypical networkNetwork with increased variability in the color, thickness, and spacing of the lines of the network; asymmetrically distributed; gray color, blue-white veil and atypical vascular pattern), whereas the remaining four were considered as minor (irregular streaksThis glossary term has not yet been described., irregular dotsAny distribution of dots other than dots as described for regular dots./globulesThis glossary term has not yet been described., irregular blotches and regression structuresThis glossary term has not yet been described. )(Table 1). To validate this algorithmIn mathematics and computer science, an algorithm (Listeni/ˈælɡərɪðəm/ AL-gə-ri-dhəm) is a self-contained sequence of actions to be performed. Algorithms can perform calculation, data processing and automated reasoning tasks., a univariate statistical analysis was used to determine differences between melanoma and neviThis glossary term has not yet been described.. A score of 2 points was assigned to the criteria with odds ratios > 5, (major criteria), while a score of 1 point was assigned to the criteria with odds ratios < 5 (minor criteria). 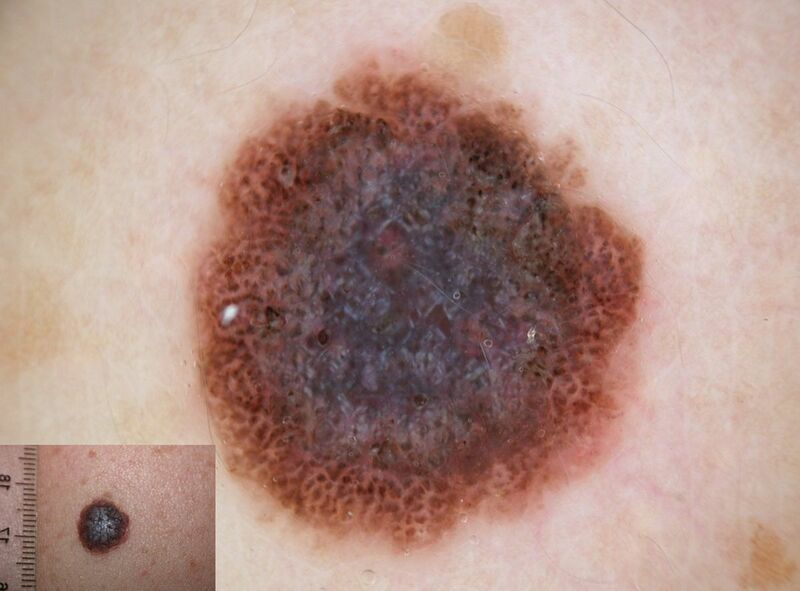 A minimum total score of 3 allows identifying melanoma with a sensitivity of 95% and a specificity of 75%. In other words, at least two dermoscopic criteria (one major and one minor) must be present for a suspicious diagnosisis the identification of the nature and cause of a certain phenomenon. Diagnosis is used in many different disciplines with variations in the use of logic, analytics, and experience to determine "cause and effect". In systems engineering and computer science, it is typically used to determine the causes of symptoms, mitigations, and solutions. According to a revised, simplified seven-point checklist, the presence of at least one of the seven criteria should allow the diagnosis of melanoma with a sensitivity of 85-93% and a specificity between 45 and 48%. In 2003 the various dermoscopic algorithms (classical pattern analysisThis glossary term has not yet been described., the ABCDThis glossary term has not yet been described. rule, Menzies' method and the seven-point checklist) were re-evaluated and tested by non-experts. In details, 16 physicians not familiar with dermoscopyThe examination of [skin lesions] with a 'dermatoscope'. This traditionally consists of a magnifier (typically x10), a non-polarised light source, a transparent plate and a liquid medium between the instrument and the skin, and allows inspection of skin lesions unobstructed by skin surface reflections. Modern dermatoscopes dispense with the use of liquid medium and instead use polarised light to cancel out skin surface reflections. examined imagesA representation of a person, animal or thing, photographed, painted or otherwise made visible. of 20 pigmented lesions using the different methods, before and after an Internet-based training course on dermoscopy. The results showed a significant improvement in the dermoscopic diagnosis of melanoma after the Web training for pattern analysis with the ABCD rule and Menzies' method, but not for the seven-point checklist, which allowed higher sensitivity even before the web course. For this reason, the seven-point checklist is considered among the algorithms with the best sensitivity for the non-expert investigators. Afterwards, in the Consensus Net Meeting on DermoscopyThe examination of [skin lesions] with a 'dermatoscope'. This traditionally consists of a magnifier (typically x10), a non-polarised light source, a transparent plate and a liquid medium between the instrument and the skin, and allows inspection of skin lesions unobstructed by skin surface reflections. Modern dermatoscopes dispense with the use of liquid medium and instead use polarised light to cancel out skin surface reflections., the value of the seven-point checklist was definitively confirmed. As previously mentioned, the seven-point checklist allows defining a lesion as suspicious when at least one minor and one major criteria are present (score of 3 or more). Although generally multiple malignant features are at same time present in a given melanoma, sometimes just one of them is prevalent. Particularly, this is true for lesions showing regression in more than 50 % of the lesion surface (Fig.5) or lesions with spitzoid features . MelanomaThis glossary term has not yet been described. incognitoThis glossary term has not yet been described. Melanomas may mimic clinically a variety of benign lesions as nevi, seborrheic keratosisThis glossary term has not yet been described., pyogenic granulomaThis glossary term has not yet been described. and dermatofibromaDermatofibromas are hard solitary slow-growing papules (rounded bumps) that may appear in a variety of colours, usually brownish to tan; they are often elevated or pedunculated. A dermatofibroma is associated with the dimple sign; by applying lateral pressure, there is a central depression of the dermatofibroma.. Dermoscopic examination on all skin lesions is the only way to identify lesions that appear clinically benign but are indeed malignantThis glossary term has not yet been described..
Melanoma, especially the hypo/amelanoyic type, could not show dermoscopic features of melanocytic lesions and be confused with benign and inflammatoryThis glossary term has not yet been described. lesions. To avoid this mistake, if the pattern of a lesion is not suggestive to determine its nature, the biopsy is mandatory. Starbust patternThis glossary term has not yet been described., tipically associated with Spitz nevusThis glossary term has not yet been described. of childhood, could be a melanoma clue in adulthood. Thus, all lesions with spitzoid features must be excised in adult patients. Regression structuresThis glossary term has not yet been described., namely white scar-like areas (corresponding to fibrosis) and blue pepper-like granules (corresponding to melanophages) are alarming bells also in the absence of other melanoma signs, especially in fair skin individuals with multiple nevi. 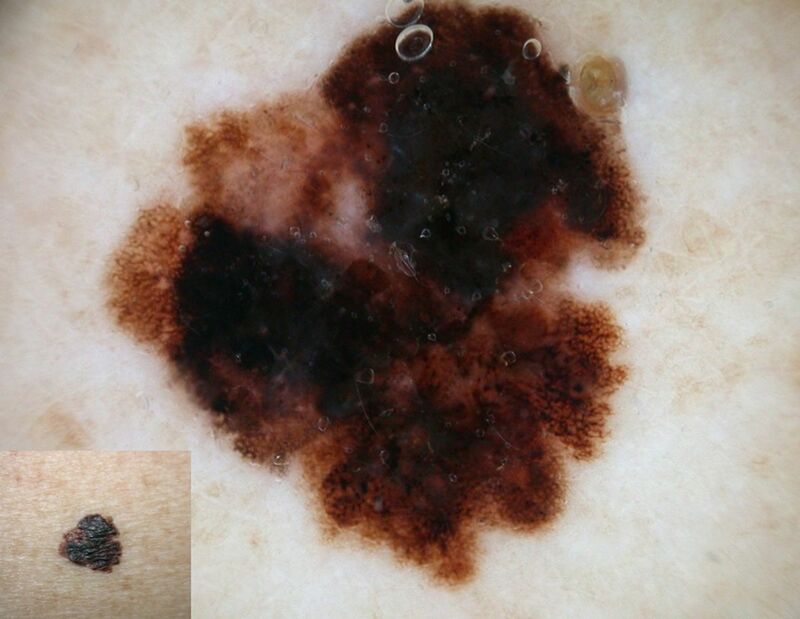 A paper published in 2004 has demonstrated that the risk for a lesion to be a melanoma is directly correlated with the extent of regression seen with dermoscopy. Therefore, lesions showing significant regression structures (in particular more than 50 % of the lesion area) should always be excised independently from its additional dermoscopic features. About 10% of melanomas do not show at the baseline examination clear-cut clinical and dermoscopic features of malignancy. Therefore, flat lesions, moderately atypical, in patients with multiple atypical nevi, must be monitored with digital images and re-evaluated after a short-term follow-up (3 to 6 months). A rapid change at dermoscopic evaluation is sufficient to require excision. However, follow-up is not a good strategy for nodular lesions that must be immediately excised because also a short delay in the treatment of nodular melanomaThis glossary term has not yet been described. might negatively impact on its prognosis. Atypical vascular pattern, such as dotted and linear-irregular vesselsThis glossary term has not yet been described., is a malignancy feature, especially for hypo-amelanotic lesions. 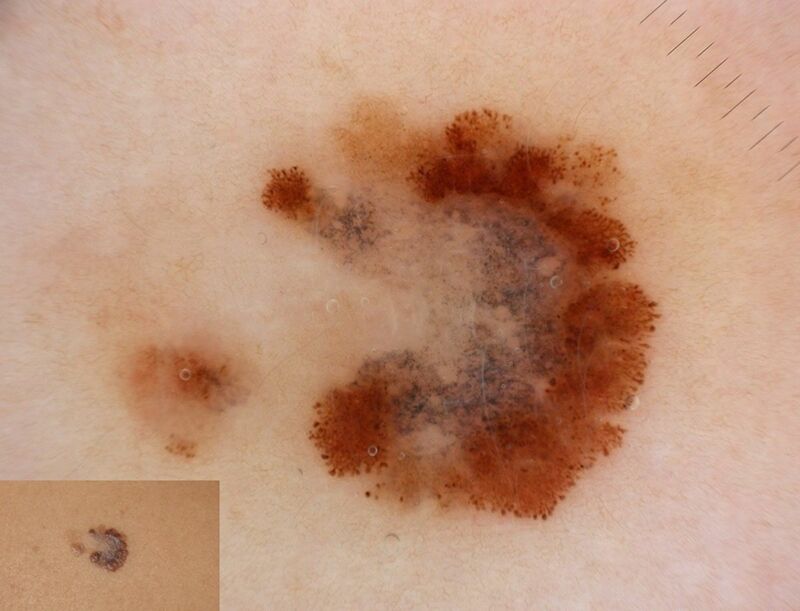 Therefore, pink lesions showing these features, in absence of other melanoma criteria, should always be biopsied (Fig. 6). The lack of correlation between clinical and dermoscopic features is a sufficient reason to perform a biopsy. For example, a lesion that clinically appears like a dermal nevus but dermoscopically doesn't reveal the usual dermal nevus features, must be excised (Fig. 7). Figure 3: Irregular brown globules are visible at the periphery (1 point) and blue-whitish structuresThis glossary term has not yet been described. in the center (2 points). The total score is 3. Histopathologic diagnosis: melanoma (Breslow thickness: 1.3 mm). Figure 4: Dermoscopically, the lesion shows peppering in the center (1 point), atypical network (2 points) and irregular globulesGlobules with variability in color, size, shape or spacing and distributed in an asymmetric fashion at the periphery (1 point). The total score is 4. 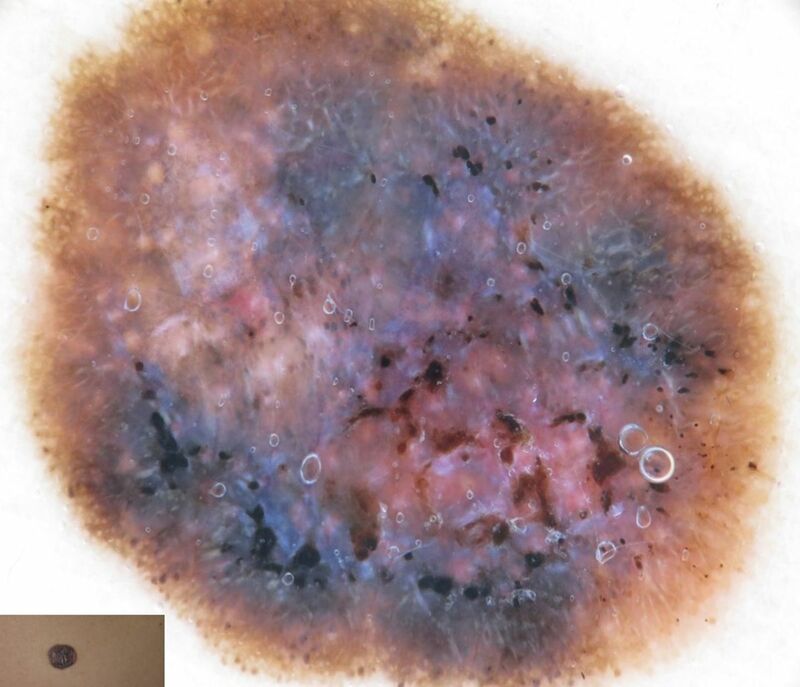 Histopathologic diagnosis: melanoma in situnot seen to be spreading from a localized position. Figure 5: This lesion presents exclusively regression structures and should be biopsied. Histopathologic diagnosis: melanoma in situ. Figure 6: This lesion is characterized by irregular vessels and a central regression area. The final total score is 3. Histopathologic examination: melanoma (Breslow thickness: 0.3 mm). ↑ Argenziano et al. : Epiluminescence microscopy for the diagnosis of doubtful melanocytic skin lesions. Comparison of the ABCD rule of dermatoscopyThe examination of [skin lesions] with a 'dermatoscope'. This traditionally consists of a magnifier (typically x10), a non-polarised light source, a transparent plate and a liquid medium between the instrument and the skin, and allows inspection of skin lesions unobstructed by skin surface reflections. Modern dermatoscopes dispense with the use of liquid medium and instead use polarised light to cancel out skin surface reflections. and a new 7-point checklist based on pattern analysis. Arch Dermatol 1998;134:1563-70. PMID: 9875194. ↑ Bafounta et al. 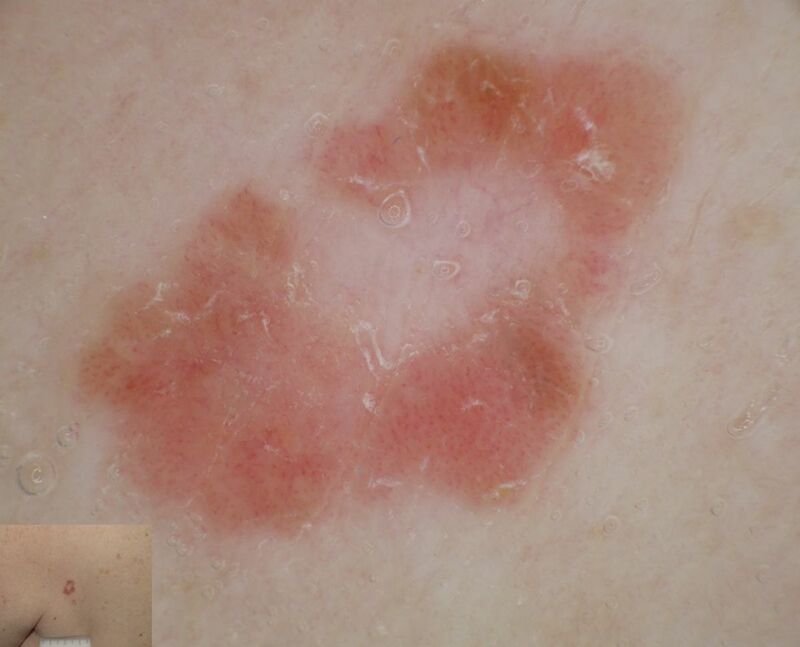 : Is dermoscopy (epiluminescence microscopy) useful for the diagnosis of melanoma? Results of a meta-analysis using techniques adapted to the evaluation of diagnostic tests. Arch Dermatol 2001;137:1343-50. PMID: 11594860. ↑ Pagnanelli et al. : Diagnosisis the identification of the nature and cause of a certain phenomenon. Diagnosis is used in many different disciplines with variations in the use of logic, analytics, and experience to determine "cause and effect". In systems engineering and computer science, it is typically used to determine the causes of symptoms, mitigations, and solutions of pigmented skin lesions by dermoscopy: web-based training improves diagnostic performance of non-experts. Br. J. Dermatol. 2003;148:698-702. PMID: 12752126. ↑ Ferrara et al. : The spectrum of Spitz neviThis glossary term has not yet been described. : a clinicopathologic study of 83 cases. Arch Dermatol 2005;141:1381-7. PMID: 16301385. DOI. ↑ Argenziano et al. 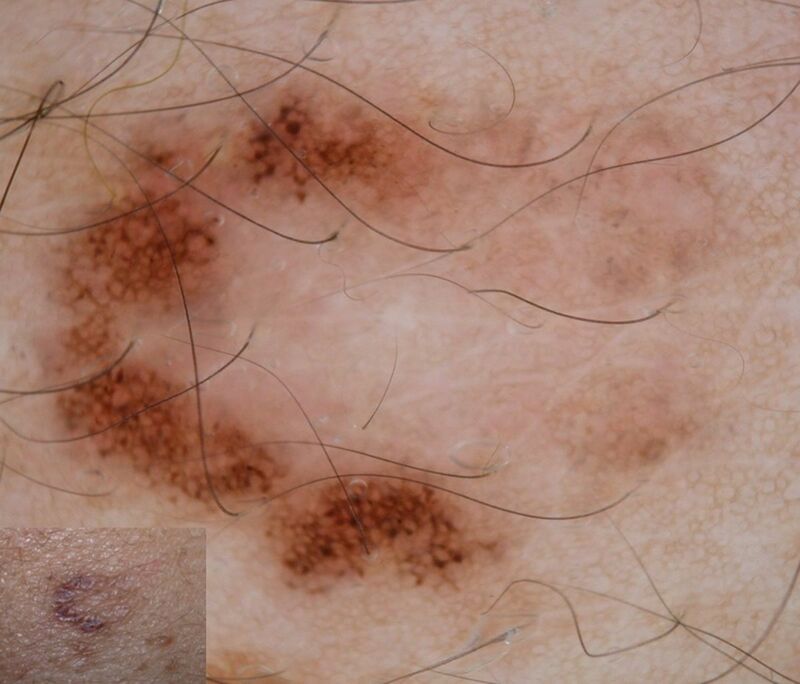 : Dermoscopy features of melanoma incognito: indications for biopsy. J. Am. Acad. Dermatol. 2007;56:508-13. PMID: 17113189. DOI. ↑ Zalaudek et al. : Time required for a complete skin examination with and without dermoscopy: a prospective, randomized multicenter study. Arch Dermatol 2008;144:509-13. PMID: 18427045. DOI. ↑ Zalaudek et al. : Clinically equivocal melanocytic skin lesions with features of regressionThis glossary term has not yet been described. : a dermoscopic-pathological study. Br. J. Dermatol. 2004;150:64-71. PMID: 14746618. ↑ Zalaudek et al. : Dermoscopy for challenging melanoma; how toGives basic instructions and directions to someone on the methods for doing or making something. raise the 'red flag' when melanoma clinically looks benign. Br. J. Dermatol. 2005;153:200-2. PMID: 16029351. DOI. ↑ Zalaudek et al. : How toGives basic instructions and directions to someone on the methods for doing or making something. diagnose nonpigmented skin tumors: a review of vascular structuresThis glossary term has not yet been described. seen with dermoscopy: part I. MelanocyticThis glossary term has not yet been described. skin tumors. J. Am. Acad. Dermatol. 2010;63:361-74; quiz 375-6. PMID: 20708469. DOI. This page was last modified on 6 March 2018, at 17:02.